We’re thankful to be able to grow tomatoes, peppers, and other veggies and herbs on our deck where the deer and squirrels aren’t likely to share in the feast! 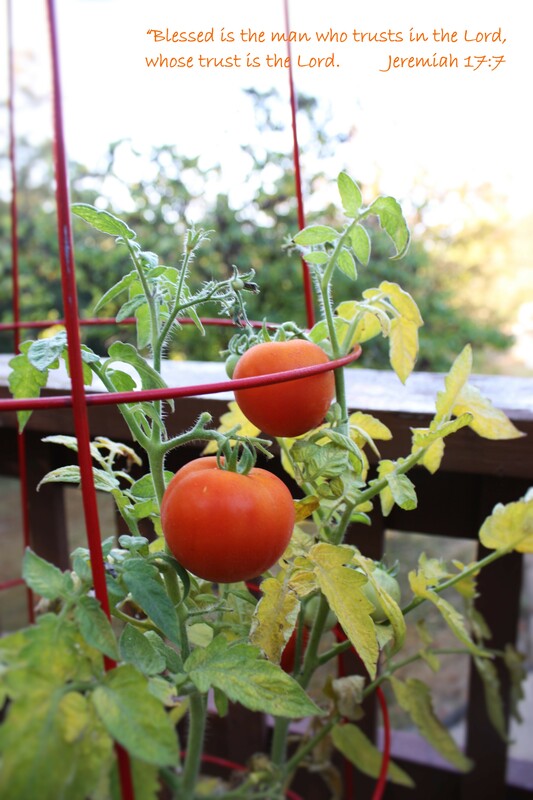 This summer we planted two variety of reds–Roma and Cherry Girl, and two of yellow pear tomatoes. They are all still producing, though ripening slowly now that Fall temperatures have arrived. Sometimes a tomato or two doesn’t even make it into the kitchen. This entry was posted in Autumn, Botanicals, Vegetable Gardening OurBackyard and tagged Autumn, botanicals, Gardening, Healthy Foods, Tomatoes, Vegetables. Bookmark the permalink.